Oh, my God! Is there something more extreme than the adventure of descending by a sparkling and abundant river of white waters, under the rain, only with the help of oars and an inflatable boat? Definitely, Rafting is an extreme adventure activity, special for daredevils and adrenaline lovers, and fortunately, there are numerous natural waterfalls to enjoy it. This time, we visited San Gil, Santander, capital of tourism and adventure land in Colombia, it is an epicenter of extreme sports, family vacations, tourist plans and convention centers. In San Gil, the tourist capital of Santander, you can enjoy with your family and friends adventure activities such as Rafting where they are national leaders, and walk on the water on the Tibetan bridge that will take you to a world where you will discover the magic of nature and you will live an unforgettable adventure in the Chicamocha National Park. The best thing about Rafting is that it is practiced as a team, giving you the opportunity to share the experience with friends, so gather now that group of friends who share your love for nature, action and adventure, and get ready to descend through the turbulent rivers of San Gil. The adventure begins with a jump of around 8 meters, where the descent begins, dragged by the current of the river, during the tour you will find ravines, canyons, overpasses and many waves, yes, waves! The boat is dragged by the current while it must be directed as accurately as possible, using a short paddle and following the instructions of the instructor or monitor, who directs the boat. The objective is to avoid all the obstacles that the river presents. To practice it, it is necessary to be alert and trust fully in the other people that go on the raft, as well as a good protection team to avoid severe blows. So, what do you say? Do you feel fearless? 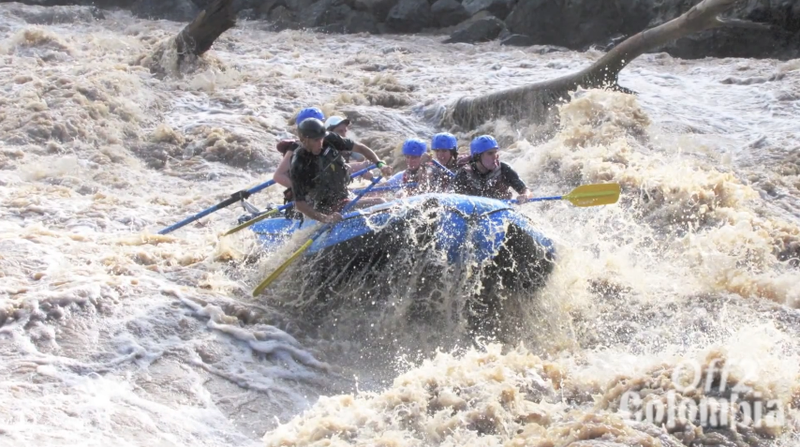 Is there something more extreme than the adventure of descending by a sparkling and abundant river of white waters, under the rain, only with the help of oars and an inflatable boat?